Its summer and it seems like everyone is going on a trip. But our family is not and I don’t need to leave town to have fun. It just takes a little research, creativity, and planning to find great things to do. We can always find enjoyable things to do regardless of how much money we have or don’t have. Summer fun is here in Colorado. Today we played with water balloons and water guns on our trampoline with friends. We celebrated the beginning of summer with Ice – Cream sodas. Together we work in our garden planting and finding worms. We like to visit an eagle at one of our parks by our house. There are skate parks all around us and bike paths to ride on. There are puddles, streams, and lakes for us to feed crawdads hotdogs. In Colorado we have the Rocky Mountains to go look for bears. There are rattlesnakes under rocks which makes hiking a little bit more adventurous. Our libraries and rec centers offer performing art shows for free or a very small fee. There are historical parks and museums to visit. Here in Denver we have a membership to the Children’s Museum, Butterfly Museum, and the Zoo. We schedule play dates with friends, swimming indoors and outdoors, painting outdoors and reading books under the trees. It’s going to be a fun summer. No schedule to worry about or follow. BBQ and marshmallow roast late at night. No alarm to wake us up in the morning. Roller skating classes, digging in the sand and lakes, cooking, and chasing butterflies. 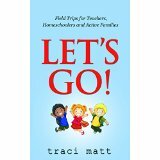 This book is for Teachers, Homeschoolers, and Active Families. Families like you and me that want to have creative fun and educational fun. Let’s Go is all about field trips. Where to go, how to get in, who to talk to, and when to go. My kids and I pretend our truck is a bat mobile, or a boat, or a train, or a bus…. And adventure out on field trips. Traci talks about places I never even thought of. Places I didn’t even consider going because I didn’t see the value in it. If you are looking for ideas to do with your kids this summer or all year around this book is for you. If you homeschool like me and you enjoy doing community outings, this book is for you too. She has ideas of places you can go for History, Performing Arts, Visual Arts, Social Studies, Physical Education, Science and Math. I love this book for year around and for all ages. It’s a great resource. I would love to hear what you all have planned for this summer. Fun In The Sun Learning Activities, By Missy The Home School Mom! We live off the coast of Maine in a very small town so there is not much in the way of museums, etc but this summer we plan to (if it ever warms up, that is) spending countless hours at the various beaches, going on hikes, playing in our above-ground Walmart pool and more in that line of thought. It seems like our school years are so busy, I want my summers for my children to be an unstructured as possible! Beaches – how fun!!! Collect sea shells and build sand castles and it is wonderful to be free from structure. Just go with the flow. Have fun and thanks for coming by. It’s always a blessing to have you stop by. We love Geocaching, bird watching, eating breakfast on our deck, catch and release fishing, garage sales, picnics, container gardening, pizza dinners on high mountain passes, drives on remote mountain roads, and “car naps”…..
Yep that all sounds really fun!! We love Geocaching too.